Is there anything more enjoyable than reading a newspaper on a lazy Sunday morning, outside to the porch where you can bask in the sunshine or to the backyard under the shade of your favorite tree? Wherever you enjoy your morning paper, invite your child to join you with some of these newspaper reading activities! Remember: Any kind of reading will help increase your childs reading scores and her love of reading. Just spending this kind of quality time will go a long way to helping your child become a lifetime reader. Choose a section of the paper you are finished reading and one you think your child will be particularly interested in such as sports or local events. Clip an interesting news story and cut the paragraphs apart. Hand the article to your child in pieces and ask him to read the paragraphs and put the article back together in the proper order. Read the article together and talk about the news story. Give your child the editorial section and two different colors of highlighter pens. Ask her to highlight all the facts in one color and the opinions in the other color. Talk about the article together. Help your child see that sometimes people with the same facts form different opinions. Also it might be interesting to note that people spout their opinions without any consideration of the facts. Use this time as an opportunity to help children see that forming opinions based on facts makes a lot more sense than just forming opinions for opinion sake. Clip photographs from the newspaper. Dont include the captions and ask your child to write a caption telling about the picture. Its okay to make the captions humorous, but make sure your child is noticing details in the photographs so that the captions fit whats happening in the picture. This is a good way to help your child improve in the important reading skill of finding details. Read the comics with your child. Young children wont understand most of the comics in a newspaper until they are about ten or eleven years of age. But it is fun to see the first “I get it!” moment when your child understands a comic for the first time. Have your child cut out his favorite comic and glue it on paper to create his own comic book that he can read anytime. Or have your child just cut the pictures from the comics and write her own caption or conversation. The crossword puzzle in the newspaper may be too much of a challenge for your child, but you can create a word game by cutting out the large headlines from the newspaper. Cut the individual letters of the headlines. Then challenge your child to make new words or even a new headline from the letters. Provide paper and glue and allow your child to record her word creations. 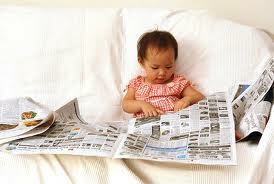 Read the advice column of the newspaper with your child. Talk about the problems that are being written about and the answers the columnist gave. Ask your child if they think the advice is good. Then have your child write his or her own advice for the problems. Perhaps your child will want to write about his or her problems in a similar way. Then you can play the role of the columnist. This type of role playing may be the start of some healthy communication between you and your child. Use these and other ideas you come up with as you take the time to read the paper with your child. If you foster an atmosphere for reading in your home through fun and informal activities such as these, you’ll instill a love of reading in your child that will go beyond the standardize test.